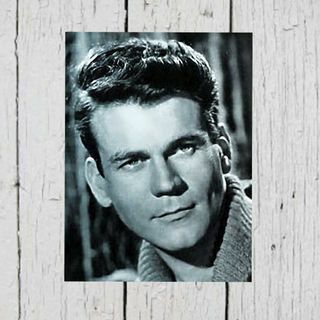 Don Murray's role as Beauregard "Beau" Decker in Bus Stop (1956) marked his film debut. He starred alongside Marilyn Monroe, who played Cherie, the object of his desire. His performance as the innocent cowboy who is determined to get Cherie was well received, and he was nominated for a BAFTA for Most Promising Newcomer and for the Academy Award for Best Supporting Actor. In 1957, he starred as reserved, married bookkeeper Charlie Sampson in The Bachelor Party. The same year ... See More he starred in one of his most successful roles, that of Johnny Pope in the drama A Hatful of Rain. Despite director Fred Zinnemann's intention to typecast the actor as the comical brother Polo, Murray insisted on playing the lead. Thus he portrayed Johnny Pope, a morphine addicted Korean War veteran. The film was one of the first to show the effects of drug abuse on the addicted and those around him. He starred as a blackmailed United States senator in Advise & Consent (1961), a film version of a Pulitzer Prize-winning novel by Allen Drury. The movie was directed by Otto Preminger and cast Murray opposite Henry Fonda and Charles Laughton. He also co-starred with Steve McQueen in the film Baby the Rain Must Fall (1965) and played the ape-hating Governor Breck in Conquest of the Planet of the Apes (1972).n 1976, Murray starred in the film Deadly Hero. In addition to acting, Murray directed a film based on the book The Cross and the Switchblade (1970) starring Pat Boone and Erik Estrada.Murray starred with Otis Young in the ground breaking ABC western television series The Outcasts (1968–69) featuring an interracial bounty hunter team in the post-Civil War West. In 1979, he starred as Sid Fairgate on the long-running prime-time soap opera Knots Landing. He also scripted two episodes of the program in 1980. In 1981 Murray decided to leave the series after two seasons to concentrate on other projects, although some sources say he left over a salary dispute. The character's death was notable at the time because it was considered rare to kill off a star character. The death came in the second episode of season three, following season two's cliffhanger in which Sid's car careened off a cliff. To make viewers doubt that the character had actually died, Murray was listed in the credit sequence for season three; in fact, season three revealed that Fairgate had survived the plunge off the cliff (thus temporarily reassuring the viewers), but died shortly afterwards in hospital. Although he effectively distanced himself from the series after that, Murray later contributed an interview segment for Knots Landing: Together Again, a reunion special made in 2005.In 1956, Murray married Hope Lange, with whom he had co-starred in Bus Stop. They had two children, Christopher and Patricia. They divorced in 1961. In 1962, he married Elizabeth Johnson and then had three children: Coleen, Sean, and Michael.